Roguelikes have been landing on the Nintendo Switch from almost Day 1 of the console’s life, as indie titles originally released for PC have rained down like candy on the Switch’s unique audience. Nintendo fans are at many times exclusive in their gaming preferences – both by choice and out of necessity. Without the deluge of AAA third party titles that hit Microsoft and Sony’s consoles, the Switch is currently serving as impressively fertile ground for indie developers. Nintendo fans, as it turns out, may not have time for the latest $80 Call of Duty bundle, but they always have time for a $15 roguelike. 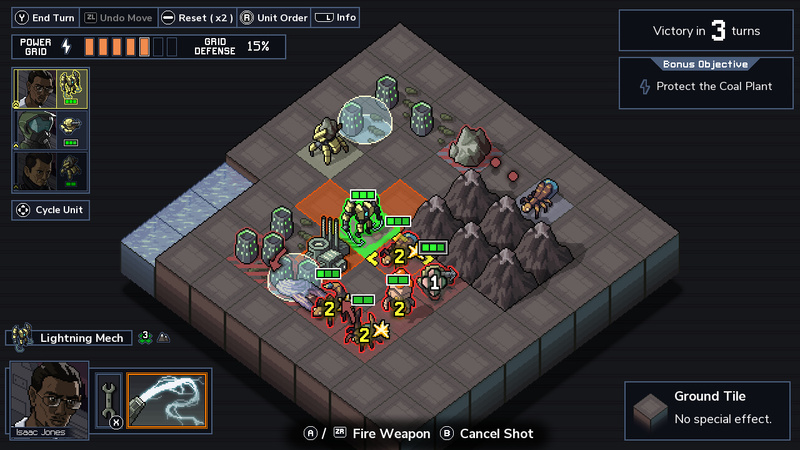 Into this ecosystem launched a new kind of roguelike, which mashes up tactical RPG combat, a slick science fiction setting, and enough procedurally generated goodness to keep players occupied for dozens of hours on end – Into the Breach. After a series of cataclysms left the nations of Earth broken, devastated, and overrun by rising sea levels, small islands of humanity have finally found some sense of stability. Each island’s government is run by a mega-corporation, and each specializes in a given field – robotics, environmental and cultural restoration, terraforming – you name it. Technology and civilization both are finally on the upswing. That is, until the Vek arrive. Giant, insectoid alien invaders attack the islands and begin a new crisis that threatens to destroy all of humanity. As conditions continue to worsen, the beleaguered governments quickly realize that they are fighting a losing war. Each lesson they learn in how to fight the Vek comes too late, and the impressive new technologies are not enough to turn the tide. Finally, desperate for some kind of resolution, humanity elects to send its most seasoned soldiers back in time, so that they may prevent the tragedy of the Vek from ever occurring. By sending the pilots and their advanced robotic mechs to the beginning of the Vek invasion, they set off a chain of events they never anticipated. Because while the pilots may indeed emerge victorious, they only serve to save a single timeline among a myriad of possible pasts, presents, and futures. Now, the pilots jump from timeline to timeline, fighting the Vek at every turn, trying to give humanity – every humanity – a fighting chance for survival. While the original timeline may indeed be lost, hope lives on for others, if the skills of the pilots can only hold out. Despite its compelling story conceit, Into the Breach features little in the way of in-game narration. Instead, players are presented with simple menus offering only the most basic of information. What are these mechs called? What weapons do you have at your disposal? Who are these pilots and what skills do they possess? What is the situation report for any given island on which you may battle the Vek? These basic questions are answered quickly as the player is encouraged to immediately dive into the game’s tactical-based combat. Actual combat encounters play out on a simple isometric grid. The graphics and sound are neither flashy nor impressive, but follow the same simplicity presented by the game’s menus. Each mech, enemy, building, and environmental feature has a simple, recognizable design, which allows players to quickly acclimate themselves to the game world. Sound effects are similarly straightforward, as you can distinctly hear every explosion, burning fire, and splash in the ocean. The game’s music is moody, atmospheric, and overall unobtrusive, encouraging the player to focus on their strategy, rather than get sucked into an audio/visual experience. Each combat mission the player embarks on has a clear set of objectives. You may be asked to protect certain buildings, prevent a certain amount of mech or building damage, or to destroy specific enemies or environmental landmarks. In true roguelike fashion, each island has a set number of objectives and procedurally generated layouts, which serve to keep every engagement a little different than the last. Completing objectives earns players some kind of reward – either reputation points that can be spent on various upgrades once an island has been cleared, or “Grid Points” which serve as an overall life bar for your entire run. Each time a building takes damage, you lose these grid points – so players must always be mindful of collateral damage. Once the player has cleared four missions on a given island, the Vek will launch an attack on the island headquarters – forcing players to fight against super-powered versions of standard enemies in the process. Meanwhile, clearing two of the game’s four islands unlocks the final mission of the game – which you may choose to pursue in lieu of liberating the next island of your choice. Each island (including the final mission) gets progressively more difficult as you clear other islands of your choice. This simple setup gives the player a clear set of objectives and the ability to choose the difficulty of particular islands at their leisure. If you feel your particular team of mechs might struggle on the ice-themed island, you can go there first and save yourself the hassle. Enemy attacks vary from simple to complex. Some Vek may simply walk up to a mech or building and attack the adjacent tile, while others will shoot from long distances, lob attacks over buildings, or even spawn smaller baby Vek to increase their numbers. In addition, special “Psion” provide stat bonuses to the entire enemy party, and must be dealt with quickly, and at higher difficulties souped upon version of classic mechs will gain attacks that deal extra damage or hit a wider array of tiles. While there isn’t a huge amount of enemy variety once you’ve put several hours into the game, the randomization of maps, objectives, and enemies provides enough variation to keep you coming back again and again. 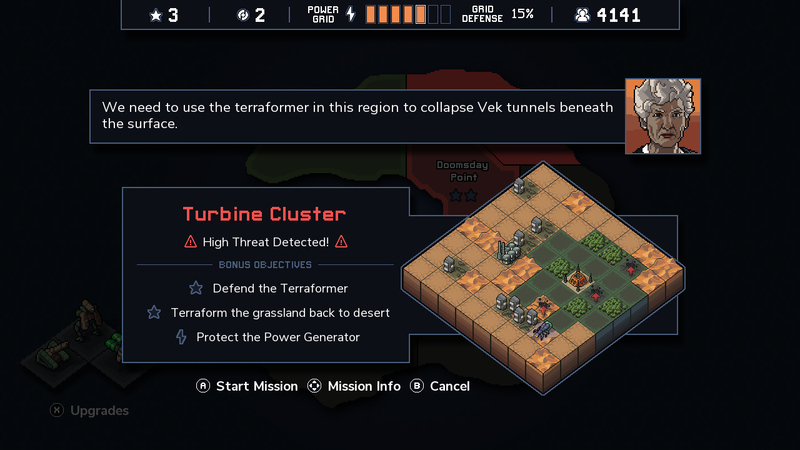 Perhaps the strongest feature of Into the Breach – and easily the game’s biggest differentiator from other tactical titles – comes from how the developers inserted their time travel theme into gameplay. 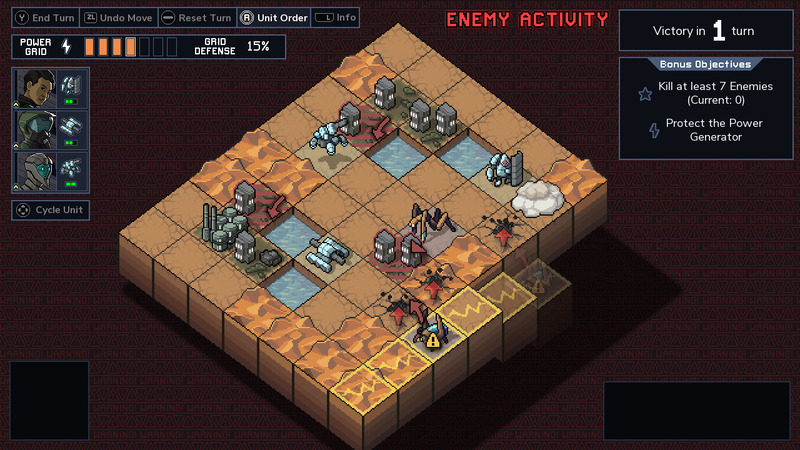 Each turn begins with the Vek arranging themselves around the map, preparing to attack specific mechs or buildings. At that exact moment, before the Vek’s strikes actually hit, the player is able to move and attack before they can. The conceit seems to be that the pilots knows how and where the Vek will strike and are able to act to prevent the devastation. Mechs are equipped with many weapons that not only deal damage to enemies, but also push and pull them around the map, forcing them to miss their targets and sometimes even attack each other. This small glimpse into the future creates a different sort of ebb and flow to combat from other tactical games, and excellently integrates the game’s time travel theme. Other means of disrupting the Vek’s attacks abound as the game goes on. On many maps, environmental effects such as thunderstorms, earthquakes, or even airstrikes from the local military are also forecasted to the player before they take their actions. If players can maneuver the Vek into these hazards, they can deal critical damage that leaves most enemies as burning husks. In addition, the new Vek who spawn at the end of each turn show up as little burrowing holes during the Vek’s movement phase. Players can position themselves or the existing Vek to block these spawn points, prevent the new Vek from arriving for a turn and damaging the unit standing over the spawn. One final bit of story and gameplay integration comes with a small “player forgiveness” feature added to combat. As you are moving your mechs around the field of battle, you may notice you’ve made a wrong move or created some unexpected consequence. Have no fear, because once per battle your pilots can roll back time to the start of the turn, wiping the map clean of any player actions. This small feature is meant to give players some wiggle room in the game’s more complex interactions – but is well appreciated from both a gameplay and immersion standpoint. While the objectives, maps, and enemies may be randomized within each island, the crew you bring into battle is anything but. 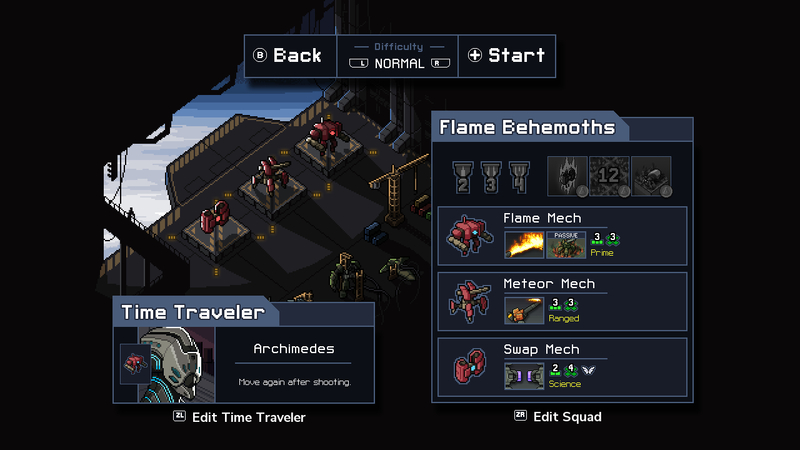 Players choose their starting pilot and team of three mechs before deploying into a given timeline. Each pilot comes with a special ability, which includes skills such as the ability to shrug off one point of damage from attacks, immunity to certain weather effects, or even the ability to twice-reset time in battle. Your starting pilot will be joined by two other, less skill pilots from the native timeline, all of whom gain experience and level up with upgrades to their mechs. If you want more time travelers to join your team, you’ll need to rescue them from time pods that randomly fall in battle, or else recruit a version of the time traveler from the current timeline. As one added story integration bonus, whenever a timeline ends (in victory or defeat), you are able to take one of your pilots with you on your next run – sending them through the portal to protect a new timeline, bringing all their experience with you. Mechs, meanwhile, are organized into specialized squads of three. The starting mechs are straightforward bruisers, mostly damaging and pushing the Vek in battle. As you continue playing, you will unlock additional squads that are more highly specialized. Some squads may focus exclusively on re-positioning the Vek and forcing them to hurt each other, while others use fire, ice, and other hazards and status effects to do the bulk of their damage. Each of the three mechs fall into one of four categories – the walking, humanoid Prime mechs, the tank-like Brutes, long-range Artillery mechs, and specialized Science mechs, who use non-damaging skills to hamper the Vek or boost the skills of their allies. The weapons, health, and speed of these mechs can be upgraded throughout your run, expanding your arsenal and utility and bringing additional customization options to your team. Each squad (including the option for randomized and custom squads) comes with a set of achievements that earn you in-game gold, used for unlocking additional squads as you play. Nearly all the achievements seem to be designed to teach the player some nuance of the given squad – enhancing your skills and understanding of the game’s mechanics as you work towards unlocking the next team. 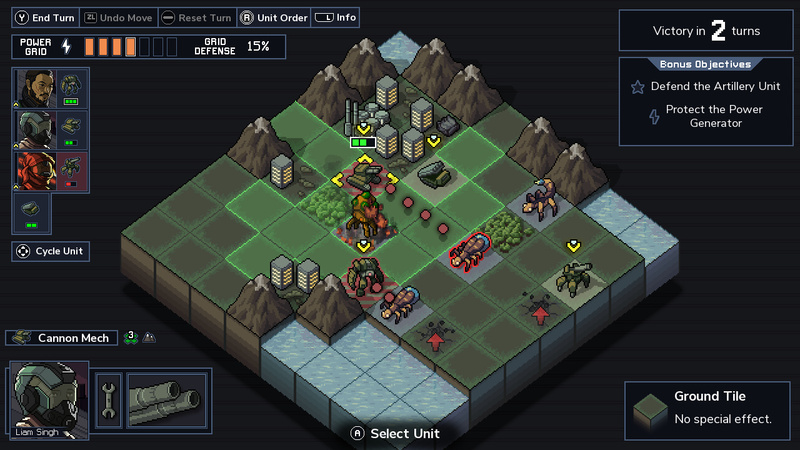 In all, Into the Breach is an impressively well thought-out package. Fans of tactical RPGs and roguelikes will find much to love – from the masterful gameplay/story integration, variety of combat options, or the myriad of achievements and unlockables. Having already put 30+ hours into this $15 title (while barely scratching the harder difficulty settings), I can confidently say I could easily put in dozens more without the experience growing stale. 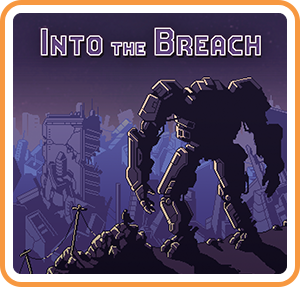 Into the Breach is without a doubt one of the finest indie games currently gracing the eShop.